Does anyone have a remedy for poor gas mileage for 2.5 cvt 2011 Outback? Mileage went from 27 - 32 first, to 21 - 26 thereafter. Always serviced, use good gas, tires inflated, etc. it must have something to do with the engine or computer. All the codes check out. Really disappointed with this. I also noticed many others have the same problem. Thanks. I don't own an Outback, but Fuelly says that based on over 5 million miles of driving, the MPG most people are getting in the 2.5 CVT is 25.21 MPG, which is about what you are getting. EPA rating is 24 MPG combined. Did you do any recent maintenance or are you running winter gas? Weather is a factor, too. Did you change your commute? Sitting with the car on kills gas mileage on cars that don't have the auto start-stop feature. If you are in the northeast the weather has been mostly cold since December. Gas mileage will drop when temperatures are 40-50?F and will sink when temp are in the teens. Excessive idling doesn't help. When temp drop so do tire pressures. I can almost one psi drop for each 10? drop. Tire pressures set at 38 at 60? will be in the low 30 psi range at 10?. Fuel economy returns when the temperatures do in the spring. I'd agree with the comments made about winter driving. My Spark which gets normally 45+ MPG gets less in the past few months due to the cold weather. And as stated idling etc. But one other factor that can effect fuel mileage negatively (and some will argue this) but that is the fuel filter. If your car has higher mileage and has never had the fuel filter that is normally on the underside of the tank near the fuel tank, then it's time to think about replacing it. Also they can (but agian expense) do a flow test to make sure the injectors are getting the right volume, and are not dirty/clogged. So spend some money to save some $ if the ROI is right. Or just keep driving it and waste a bit of $ over a longer period of time..the choice is yours on what you can and WANT to afford!! I agree.... weather and tire pressure fuel filter better spark plugs and wire harness better air filter, 92 octane gas and change to synthetics fluids all around. Over 100k miles....well worn rings worn out shocks worn out tires. Worn out fuel injectors. We've owned 2010, 2012 and currently own a 2014 2.5 OB. Our day to day average with all of them is 22-24 mpg. We can get outstanding mileage on a highway trip 30-36 mpg driving at 65 mph. Since this is Texas we are often driving 70+ to keep up with traffic, often 75-80 mph. Mileage drops back in the low to mid twenties at those speeds. 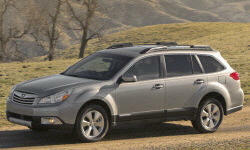 We have had over 10 Subies from Baja, WRX, SVXs, Impreza and Legacies to Outbacks. We joke that we get the standard Subaru mileage of 22 mpg no matter which one we drive in city driving.